If the sensitivity of the amygdala to threat is suppressed in individuals w/psychopathy, the prediction is that reduced cortisol & noradrenaline levels in these individuals. These predictions remain untested. But, reduced cortisol levels have been reported in life-course persistent offenders (a subset of psychopaths; Moffitt, 1993) and are predictive of future aggression levels (Shoal, Giancola & Kirillova, 2003). Reduced noradrenaline levels have frequently been associated with elevated levels of AB (Raine,1993; Rogeness, Cepeda, Macedo, Fischer & Harris, 1990; Rogeness, Javors, Mass & Macedo, 1990). In this regard, NE functioning appears to be increased in a variety of anxiety disorders (Charney, Heninger & Brier, 1984). These patients show the opposite affective impairment to individuals w/psychopathy: a heightened responsiveness to aversive cues (v appetitive cues). the suggested role of the amygdala in biasing stimulus selection (i.e., “attention”). Recent formulation suggest that attention is the result of the competition for neural representation which occurs when multiple stimuli are present (Desimone & Duncan,1995; Duncan, 1998). Which stimuli win this competition and are “attended to” is determined by both bottom-up sensor processes such as emotional salience, and top-down influences such as directed attention (Desimone & Duncan, 1995). Research has implicated the amygdala in processes involving enhanced attention for emotional information relative to neutral information, even when the emotional information is peripheral to ongoing behavior (Anderson & Phelps, 2001; Vuilleumier, Armony, Driver & Dolan, 2001). We hypothesize that the insula may also play a role in this respect. The fundamental claim is that psychopathy is associated w/early amygdala dysfunction (Blair, 2001, 2003b; Blair, Morris, Firth, Perrett & Dolan, 1999; Patrick, 1994). This does not mean that regions of the orbital frontal cortex may also be dysfunctional in this population, particular in adults with the disorder (Blair, 2003a; Mitchell et al., 2002). This model of psychopathy has as its core amygdala dysfunction. The amygdala expresses CS-UR associations. These mediate basic aversive v appetitive conditioning, defined as the learning process through which CS can come to elicit UR. This can either occur: 1) as a different association of the CS through the CeN to a specific UR (salvation to the bell that is paired to food); 2) following the formation of a CS-affect representation association w/BLA and then onto the CeN (e.g. rat experiencing a shock will demonstrate escape behaviors, but when presented with a tone that was previously paired with the shock, the rat will freeze; in this case has not learned a CS-UR association that would cause it to flee the tone but, rather, a CS-affect representation association that controls behavior through the CeN, resulting in freezing to the potential threat; Everitt et al., 2003). Amygdala dysfunction is central to pathology associated with psychopathy (Blair, 2001; Blair et al., 1999), the initial evidence came from studies demonstrating impaired aversive conditioning in individuals w/psychopathy (Flor, Birbaumer, Hermann, Ziegler & Patrick, 2002; Hare, 1970; Lykken, 1957). CS-UR or CS-affect representations is consistent w/amygdala dysfunction (Veit et al., 2002). The ability to perform aversive conditioning at age-15 is used to predict their probability of displaying AB in adulthood (Raine, Venables & Williams, 1996). Adolescent males with a persistently reduced response to a standardized stressor are over-represented in the delinquent population and that this pattern of results is a predictor of exceedingly high rates of criminal recidivism (Karnik, Delizonna, Miller & Steiner, 2003). Investigations of the modulation of the startle reflex by visual appetitive and aversive picture primes in individuals w/psychopathy (Levenston, Patrick, Bradley & Lane, 2000; Pastor, Molto, Vila & Lang, 2003; Patrick, Bradley & Lang, 1993). Considerable data suggest that the amygdala is necessary for the modulation of the startle response by CSs (Angrilli et al., 1996; Davis, 2000). The suggestion is that a visual prime, a CS, can increase the activity of brainstem neuros mediating the startle reflex through the CeN via the BLA as a result of the CS-affect representation (a CS-UR association would mean that the CS itself induced the startle response). Psychopathic individuals do show strikingly reduced levels of augmentation of the startle reflex by visual threat primes (Levenston et al., 2000; Pastor et al., 2003; Patrick et al., 1993; or see Chapter 2 by Fowles & Dindo: A Dual-Deficit Model of Psychopathy). The amygdala is not the only route to the activation of autonomic responding (Tranel & Damasio,1994). The existence of these multiple routes may explain some of the inconsistent findings with respect to autonomic responses to CSs in individuals w/psychopathy. Psychopaths show appropriate skin conductance responses (SCRs) to visual threats even to the same visual threats that fail to prime their startle responses (Blair, Jones, Clark & Smith, 1997; Levenston et al., 2000; Pastor et al., 2003; Patrick et al., 1993). Reactive aggression is more likely if the responsiveness of the basic threat circuitry is elevated either due to sensitization of this circuitry by prior threat (e.g., physical/sexual abuse) or endogenous factors (1. Originating or produced within an organism, tissue, or cell. 2. Caused by factors within the body. Used of a disease.) or due to reduced regulation of this circuitry by the frontal regions depicted in Figure 15.2 (for a review, see Blair & Charney, 2003). Psychopaths show reduced SCRs to facial expressions of sadness (Blair, 1999; Blair et al., 1977), imagined threat scenes (Patrick, Cuthbert & Lang, 1994), anticipated threat (Hare, 1965, 1982; Hare, Frazell & Cox, 1978; Ogloff & Wong, 1990) and emotionally evocative sounds (e.g., a male attack sound or a baby’s laugh; Verona, Patrick, Curtin,Bradley & Lang, 2004). Relevant to this, it has been shown that SCRs to visual threats appear to more disrupted by lesions of orbital frontal cortex rather than lesions to the amygdala (Tranel & Damasio,1994). The model makes clear the clear prediction that is made. In line w/this model, a neuro-imaging study (Phelps et al., 2001), has indicated that the amygdala plays a crucial role in generating SCRs to anticipated threat. Inconsistent data: data to reduced SCRs to negative or positive sounds (Verona et al., 2004), while 3 studies (Levenston et al., 2000; Pastor et al., 2003; Patrick et al., 1993) using visual primes found reduced augmentation of the startle reflex by aversive primes, but appropriate levels of suppression of the startle reflex by appetitive primes. SCR data of sounds suggesting dysfunctional reward-related processing, whereas the affect-modulated startle findings suggest intact reward processing. This contradiction: early models of psychopathy made reference to unitary reward/punishment systems suggesting dysfunction w/in the punishment and reward processing (Fowles, 1988; Lykken, 1995, Patrick, 1994). Such models are being refined; indeed, the integrated emotion systems (IES) model (Blair, 1003;,2004) is such a refinement. According to this view, there is no single fear system but rather partially separable systems. The systems depicted in Figure 15.2 (http://origin-ars.sciencedirect.com/content/image/1-s2.0-S0010027706000783-gr2.gif) are crucially involved in the individual’s basic-gradated response to threat or stress. Low levels of threat from a distant potential predator initiate freezing. Higher levels of threat as the potential predator closes-in lead to the animal attempting to escape its environment. At higher threat levels still, when the threat is very close and escape is impossible, the animal will display reactive aggression (Blanchard, Blanchard & Takahashi,1977). These systems which allow the expression of reactive aggression are shared w/other mammalian species (Gregg & Siegel, 2001; Panksepp, 1998). Individuals with psychopathy present w/elevated levels of aggression. A wide variety of other psychiatric & neurological conditions are associated w/elevated levels of reactive aggression, like childhood bipolar disorder (Leibenluft, Blair, Charney & Pine, 2003), borderline personality disorder (Edwards, Scott, Yarvis, Paizis & Panizzon, 2003), posttraumatic stress disorder (Pavic et al., 2003), and acquired sociopathy Damasio, 1999; Blair & Cipolotti, 2000; Grafman, Schwab, Warden, Pridgen & Brown, 1996). Individual w/psychopathy are unlikely to display heightened reactive aggression because of overactive brainstem threat circuitry. Indeed, in line with the hypothesis of amygdala dysfunction, psychopaths less responsive to environmental threat NOT more responsive. They show no difference with comparison individuals in their basic startle response to an auditory probe (Patrick et al., 1993), an index of the responsiveness of the basic threat circuitry that bypasses the amygdala. The elevated level of reactive aggression shown by psychopaths is due to dysfunction in frontal executive systems involved in the regulation of brainstem threat circuitry. Frustration has long been linked to reactive aggression (Berkowitz, 1993). Frustration occurs following the initiation of a behavior to achieve an expected reward and the subsequent absence of this reward. 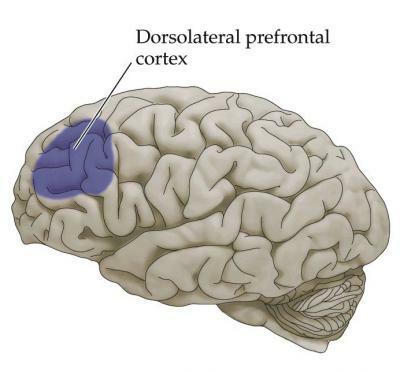 Both medial and orbital frontal cortex (including ventrolateral prefrontal cortex), Brodmann’s area 47) are involved in expectation violation computations and the error detection to induce frustration (Blair, 2004; Rolls, 1997). Both medial and orbital frontal cortex are involved in changing behavioral responding when the initial attempt to reach a goal is unsuccessful and an alternative behavioral responding when the initial attempt to reach a goal is unsuccessful and an alternative behavioral response needs to be initiated. Human neuropsychological studies (e.g., Rogers et al., 1999; Rolls, 1997; Rolls, Hornak, Wade & McGrath, 1994) indicate that damage to medial and orbital frontal cortex impairs extinction (stopping a response to a stimulus that previously had been rewarded or punished) and response reversal (learning to make an alternative response to a stimulus array to gain reward after previously learned response to the stimulus array is either not rewarded or punished). Damage to medial and orbital frontal cortex (http://dericbownds.net/uploaded_images/LatMedPFC.png) gives rise to an individual predisposed to frustration and, in consequence, reactive aggression. Individuals with psychopathy present with both impairments in extinction (extinction & response reversal) as evidenced by performance on Newman’s card playing task (Newman, Patterson & Kosson, 1987), and in response reversal (Mitchell et al., 2002; Peschardt, Leonard et al., 2004). Psychopaths with orbital frontal cortex dysfunction, leads to heightened reactive aggression (Blair, 2004). Figure 15.2 depicts 2-important neurochemical: systems that respond to stress/threat (Charney, 2003, Francis & Meaney, 1999). Neurochemical systems 1) Hypothalamic-pituitary adrenal (HPA) axis. Stress stimulates release of corticotropin-releasing factor (CRF) from the paraventricular nucleus (PVN) of the hypothalamus. CRF is released by the PVN neutrons into the portal blood supply of the anterior pituitary, where it provokes the synthesis & release of adreno-corticotropin-hormone (ACTH) from the pituitary, resulting in increased secretion of cortisol from the adrenal gland. High cortisol levels, through negative feedback, decrease both CRF and norepinephrine (NE) synthesis at the level of the PVN, and thereby constrain the PVN. The temperamental variable of fearfulness, related to the ease with which the child can be socialized (Fowles & Dindo, Chapter 2, this volume; Kochanska, 1993, 1997), can be understood as an index of the integrity of the amygdala (Blair, 2003a). For normal socialization to occur, the developing child needs to associate harmful transgressions w/punishment of the distress of the victim. Psychopaths are not able to form these associations. Parental techniques that apply to healthy children do no apply to those w/psychopathic traits associated w/dysfunctional amygdala. Instrumental learning requires the individual either to learn to perform an action to a stimulus if this action results in reward or to w/hold performing an action to a stimulus if this action results in punishment; the latter form of learning is referred to as passive avoidance learning. The amygdala (particularly the BLA) is necessary for some (e.g., passive avoidance learning; Ambrogi, Lorenzini, Bucherelli, Giachetti, Mugnai & Tassoni, 1991), but not all forms of instrumental learning (e.g., object discrimination learning and conditional learning; Baxter & Murray, 2002; Burns, Everitt & Robbins, 1999; Malkova, Gaffan & Murray, 1997; Petrides, 1982, 1985). The amygdala mediates these specific forms of instrumental learning – punishment avoidance or passive avoidance – in interaction w/other brain regions; in this case, regions involved in coding motor responses (i.e., basal ganglia and motor cortex) and specific forms of decision making (medial orbital frontal cortex) rostral anterior cingulated. The IES model … two modules of nonlinear, identical computational units were depicted that have not received much attention until now. The first: corresponds to units coding motor responses implemented by regions that include basal ganglia and premotor cortex. The second corresponds to units coding expectation of reward (implemented by medial PFC, orbital frontal cortex, rostral anterior cingulate. These units allow rapid decision making on the basis of expected reinforcement information provided by the amygdala. In the second module of the IES (SEE: Amygdala in Instrumental Learning III: …), implemented by medial orbital frontal cortex (http://upload.wikimedia.org/wikipedia/commons/e/e4/Medial_surface_of_cerebral_cortex_-_gyri.png), here a claim is being made about a commonality of function of the medial orbitofrontal w/other regions of the frontal cortex. The left dorsolateral prefrontal cortex (http://www.shockmd.com/wp-content/dorsolateral-prefrontal-cortex1.jpg) is involved in the selection of verbal response option when more than one is in competition (Frith, 2000; Robinson, Blair & Cipolotti, 1998). p. 303-304. In passive avoidance learning, the participant’s task is to learn to respond to the good stimuli and avoid responding to the bad stimuli. Computationally, the participant must code the valence associated with a particular stimulus (i.e., the participant must learn which stimuli to approach and which to avoid). In terms of the model depicted in Figure 15.1 (p.297), passive avoidance learning can be solved on the basis of stored CS-affect representation. If the individual has formed a CS-positive affect association, the individual will approach (respond to) this stimulus. If the individual has formed a CS-negative affect association, the individual will avoid (fail to respond) this stimulus. In regards to the 2nd module of the IES, Usher & Cohen, 1999 model assumes the existence of modality specific posterior units that are limited by temporal decay while anterior units use active reverberations which can sustain themselves and which are limited by displacement from competing new information. The anterior units (SEE: Amygdala in Instrumental Learning II: …) by being self-excitatory but mutually inhibitory allow rapid selection between competing, multiple active posterior response options (Usher & Cohen, 1999). The suggestion here is that the “decision” in the orbital frontal cortex may serve a similar function over units in premotor cortex. The “decision” units would receive information in order to resolve response competition on the basis of not only the activation of units coding the motor response but also expectations of reinforcement as a result of previously formed CS-affect representations and CS-valenced sensory representations (i.e., from the amygdala and insula). The more active a unit from expectation information, the more likely it will “win” the representational competition and the response associated w/this unit will be initiated. In line with the hypothesis of amygdala dysfunction in psychopathy, individuals w/psychopathy show impairments for those instrumental learning tasks that rely on the amygdala. For example, individuals with psychopathy show impairment on passive avoidance learning tasks (Blair et al., 2004; Newman & Kosson, 1986; Newman & Schmitt, 1998) but not on object discrimination or conditional learning tasks (Blair, Colledge & Mitchell, 2001; Mitchell et al., 2002). Amygdala in Instrumental Learning VIII: instrumental learning tasks requiring amygdala and DO NOTpassive avoidance learning tasks, stimulus & motor response association, stimulus-reinforcement associations, stimulus-response associations Baxter & Murray (2002) provided a theoretical basis for the distinction between instrumental learning tasks that require the amygdala (e.g., passive avoidance learning) and those that DO NOT (object discrimination and conditional learning). They argued that the amygdala is necessary for instrumental learning tasks requiring the formation of stimulus-reinforcement associations (i.e., the CS-affect representations & CS-valenced sensory representations), but NOT for tasks that require, or at least can easily be solved by, the formation of stimulus-response associations (i.e., the formation of an association between a stimulus and a motor response). Baxter & Murray (2002) argued that object discrimination and conditional learning are solved through stimulus-response associations. Object discrimination involves learning to respond to one of two objects (one rewarded and one not rewarded) repeated in a pair-wise fashion over a series of trials. In other words, participants must learn what when Stimulus A and Stimulus B are present they should respond to A.
Baxter & Murray (2002) argued that object discrimination and conditional learning are solved through stimulus-response associations. Conditional learning involves learning to perform a particular motor response in the presence of a particular stimulus; in this case, participants must learn that when Stimulus A is present they should enact Response 1, and when Stimulus B is present they should enact Response 2 (e.g., press left button if green light is on; press right button if red light is on). In object discrimination and conditional learning tasks, unlike passive avoidance learning tasks, the participant cannot learn that some of the stimuli are “good” or “bad” and thus would be approached or avoided. In object learning tasks, the compound stimulus (A or B) can be good or bad – what determines its valence is not the quality of the stimulus (this is always repeated) but the quality of the response made to the stimulus. This is even clearer w/respect to conditional learning tasks. Again, the value of the stimulus is determined by the individual’s action to the stimulus; the same stimulus can give rise to reward or punishment depending on the individual’s action. Such tasks cannot be solved by stimulus-affect representations; solved by stimulus response associations. In standard passive avoidance paradigm, participants must learn to respond to some stimuli (to gain a reward) while not responding to others (to avoid punishment). In “punishment only” passive avoidance learning, participants must learn to respond to some stimuli (if they do not, they are punished) and not to respond to others (if they do, they will be punished). Psychopaths show impairment on standard passive avoidance learning tasks (Blair et al., 2004; Newman & Schmitt, 1988), they show no impairment on punishment-only passive avoidance tasks (Newman, 1988). Fear dysfunction should predict difficulties whenever punishment information needs to be processed (Newman, 1998). Then psychopaths should perform poorly on standard passive avoidance tasks or punishment-only passive avoidance tasks. But psychopaths perform well on punishment-only passive avoidance tasks. The Amygdala in Instrumental Learning XII: object learning & conditional learning tasks article, provides a plausible explanation for this dissociation: punishment-only task variants cannot be solved through the formation of CS-affect representation associations. As there is no “good” or “bad” response, both S+ and S- stimuli can give rise to reward or punishment. Instead of forming a stimulus-reinforcement association, the participant must form a stimulus-response association: If S+, do R1 (respond); if S-, do R2 (respond differently. In short, the punishment-only versions are very similar to conditional learning tasks and, given their dependence on stimulus-response associations, are solvable by psychopaths. Psychopaths should perform poorly on standard passive avoidance tasks or punishment-only passive avoidance tasks. But psychopaths perform well on punishment-only passive avoidance tasks, which require making stimulus-response associations. On the basis of the foregoing, novel multiple stimulus/reward instrumental learning paradigms have been developed; e.g., the Snake, Tokens and Differential Reward and Punishment Learning tasks (Fine et a., 2004; Peschardt, Leonard et al., 2004). We hypothesize that these tasks require the integrity of the valence units (amygdala), and sensory-valence representations (insula), and “decision” units that represent expected levels of reinforcement (medial frontal cortex). It is important to note that the amygdala is not necessary for all forms of emotional learning. Earlier models of psychopathy suggested that the disorder was marked by reduced sensitivity to punishment, punishment based learning, or fear (Fowles, 1988; Lykken, 1995; Patrick, 1994). These models need refinement. The empirical literature suggests that there is no single fear system, but rather a series of at least partially separable neural systems that are engaged in specific forms of processing that can be subsumed under the umbrella term “fear” (Amaral, 2001; Blair & Cipolotti, 2000; Killcross et al., 1977; Prather et al., 2001). Punishment information can be used when learning about an object (when forming a CS-response association, such as if you make response 1 to stimulus A you will be punished, but if you make response 2 you will not be punished). The amygdala is crucially involved in the formation of CS-affect representations, but it is not necessary for the formation of CS-(learned) response associations (Baxter & Murray, 2002). Thus, punishment-oriented theories need to distinguish learned threats from specific types of social threat (Amaral, 2001; Blair & Cipolotti, 2000) and recognize the different forms of association that can be established with a CS as a function of punishment information (Baxter & Murray, 2002; Killcross et al., 1977). The argument made here: only those forms of punishment-based learning that are dependent on the amygdala that are impaired in individuals with psychopathy. The amygdala is necessary for the formation of stimulus-UCR associations and stimulus-reinforcement associations. These associations can be appetitive or aversive. Individuals with psychopathy are impaired in the formation of both types of associations, but the dysfunction is more substantial for aversive than appetitive associations. The amygdala is involved in 3-types of conditioned stimulus associations (Everett et al., 2003). These associations can be either appetitive or aversive. 1. Conditioned stimulus (CS) – Unconditioned response (UR) associations. Examples of CS v UR association are salivation to a tone (unconditioned stimulus) associations that had been previously associated w/food or a galvanic skin response to a colored shape that has previously been associated w/presentation of a loud noise. The CeN, not the BLA, is necessary for the formation of CS-UR associations (Everitt et al., 2003; Killcross, Robbins & Everett, 1997). The amygdala is involved in 3-types of conditioned stimulus associations (Everett et al., 2003). 2. Conditioned stimulus (CS) affect representation associations (fear or expectation of reward). The concept of is one of “emotional ‘tone’ that is tagged to a stimulus” (Everett et al., 2003, p. 234). Such a concept is widely used in theories of emotional learning (Dickinson & Dearing, 1979). The BLA, not the CeN, is necessary for the formation of these associations (Everett et al., 2003). The amygdala is involved in 3-types of conditioned stimulus associations (Everett et al., 2003). 3. Conditioned stimulus (CS) – valenced sensory properties of the US (visual appearance, sound and smell) and also “consummatory” qualities such as taste. The BLA, not the CeN, is necessary for the formation of these associations (Everett et al., 2003). But, reinforcer devaluation associations are not stored in the amygdala (Pickens et al., 2003). They are stored in the insula. p. 298. In relation to Figure 15.3, the suggestion is that a CS (conditioned stimulus) will activate CS-affect representations. The connection of these affect representations with the representation of the CS are reciprocal, the activation of the CS in turn will be augmented. All other things being equal, representations of the CS will therefore be more salient (strongly activated) than the representations of any competing environmental stimuli. Amygdala Role in Stimulus Selection/Attention I, II, II, suggest that if individual w/psychopathy present with amygdala dysfunction, they will receive markedly reduced augmentation of the representation of the CS from the reciprocal connections w/amygdala and insula. This means that if the CS is the target stimulus, preference performance will be impaired in psychopaths relative to comparison individuals (i.e., a weaker representation would. be less able to control behavior); on the other hand, if the CS is a distraction to ongoing behavior, performance will be superior in psychopaths relative to comparison individuals (i.e., weaker representation will be less of a competitor for the stimulus that should be controlling behavior). Both predictions supported by research findings: Day & Wong, 1996; Lorenz & Newman, 2002; Mitchell, Richell, Leonard & Blair, in press; Williamson, Harpur & Hare, 1991). Emotional words (e.g., murder) can be considered CSs, and they should, and do activate the amygdala and insula (Hamann & Mao, 2002; Nakic, Mitchell, Vythilingham & Blair, 2005). Consistent w/prediction, this activation in turn augments the representation of such words in termporal cortex (Nakic et al., 2005). Augmentation of the representation of affective word “stimuli” should make lexical decisions easier for those words; that is, it should be easier to state that an emotional word is a word than it is to identify a neutral word. Experimental data indeed indicate that healthy participants are faster to state that an emotional word is a word than a neutral word (Graves, Landis & Goodglass, 1981; Strauss, 1983). Moreover, they show larger cortical event-related potential – ERPs – over to emotional words than neutral words (Begleiter, Gross & Kissin, 1967). In contrast, in line w/hypothesis developed here, psychopathic individuals fail to show reaction time or ERP differences between neutral and emotional words (Day & Wong, 1996; Lorenz & Newman, 2002; Williamson et al., 1991). In the emotional interrupt task (Mitchell et al., in press), participants are instructed to make one response if a square is presented and another if a triangle is presented on a computer screen. A positive, negative, or neutral visual for 200 milliseconds before the target stimulus (presented for 150 milliseconds) and for 400 milliseconds after the target stimulus. Healthy participants are slow to respond to the square/triangle if bracketed by an emotional stimulus V neutral stimulus. In terms of the model – emotional modulation of attention, the representation of the emotional CS is boosted by reciprocal feedback from the valence representations and stimulus-affect representation associations; so it becomes a more effective competitor for attention. Psychopaths perform similarly whether the bracketing is emotional or neutral stimulus (Mitchell et al., in press). Johnston (1923) claimed that the amygdala consisted of 2-parts: the central, medial, cortical, basal, accessory basal and lateral nuclei. The dichotomy between the basolateral and central nuclei is prevalent in the amygdala literature today. and sensory association cortical areas. Many of these connections are reciprocal probably allowing the amygdala to modulate sensory processing. These connections are w/both BLA and CeN. Price, 2003. 2 of 3. A system of projections to the brain stem (extending from the hypothalamus to the medulla and the spinal cord). These pathways are implicated in the modulation of visceral function (Visceral: Referring to the viscera, the internal organs of the body, specifically those within the chest (as the heart or lungs) or abdomen (as the liver, pancreas or intestines). in relation to emotional stimuli and mostly extend from the CeN. rostral insular, and rostral temporal cortex, and the ventromedial basal ganglia. These reciprocal connections allow the amygdala to influence goal directed behavior and mostly extend from the BLA. The amygdala has long been implicated in emotional processing. The general view was that the basolateral nuclei received sensory input and allowed the formation of conditioned stimulus-unconditioned stimulus associations. These associations then allowed the basolateral amygdala (BLA) to control the activity of the central nucleus (CeN) which in turn allowed the control of hypothalamic and brainstem structures to orchestrate behavioral, autonomic and neuroendocrine responses (LeDoux, 1998, 2000). The BLA does more than control the CeN (Everitt, Cardinal, Parkinson & Robbins, 2003). The BLA projects to ventral striatum and prefrontal cortex allowing it a crucial role in goal-directed behavior.